STOP IT! 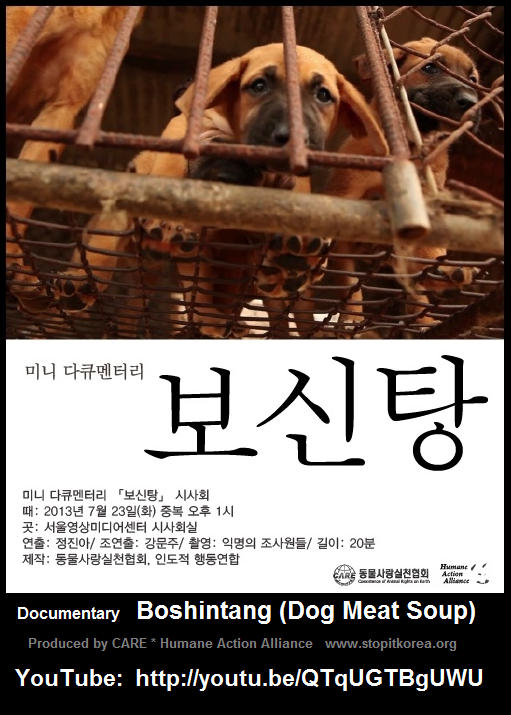 KOREA released a mini(20 minutes) documentary on South Korea’s dog meat industry from their over year-long undercover investigation and it’s now available in English. On July 23rd, Joongbok in South Korea – one of the three bokdays when the dog meat consumption peaks – CARE (Korean partner of STOP IT! KOREA) held a press conference in Seoul to present this new documentary depicting the reality of the cruel dog meat industry. New footage was also shown to an audience of journalists, news reporters and cable TV channels. You are sick! I’m not even going to watch this. I’ve already seen what you do! It’s MURDER!!!!!!!!! You can say that IF you are a vegitarien. You sick, evil, brutal bastards, O hope every one of you do this meet your own death very soon, and VERY painfully. I understand how many people feel about this practice. I have eaten dog before, not knowing it is dog. I must say, it does not taste very good. I personally would like to have a law enforced for the practice of dog eating, but what i do not understand is the comments. guys. girls. you are saying in this video that animals have feelings too, and that they should have rights. also that it is cruel to torture and eat animals like that. Then what about pigs? cows? chicken? goat? deer? horse? shark? all these animals feel pain, have children, and have rights of their own. is it these animal’s faults that they are not “man’s best friend”? just because dogs are common throughout the world as pets doesnt mean they get a right different from other animals. when i ask people this, many say “Cows are different. Oh, pigs are different.” However, the only reason they say that is because they dont want to stop eating meat. Although they disapprove eating dogs, they’re fine with eating other animals. How is that fair? I listen and listen and all i hear is “man’s best friend. Cruel. Stop. eating animals is brutal” but we are still eating them. I feel like these people should not specify which animal, but address animals as a whole. Cows have feelings. Pigs have feelings. heck, even insects can feel. oh, so eating cows are fine. torturing cows are fine. but its wrong to kill dogs becuz they’re common as pets? thats sick. Also, what many people dont understand is CULTURE. The western countries have commonly used dogs as pets. In the asian countries, however, dogs weren’t that common as pets. THey were just animals, just like chickens and cows. Its recent times that western influence has come to influence asian countries. But before, dogs were known as animals. You should understand that. I’m not saying I’m okay with dog eating. I’m just saying that this is too weird and unfair for other animals. its like, for example, lets say asian countries kept cows as pets. not as food, but as pets only. and america and other countries eat cows, and think its no problem. But those asian countries, culturally keeping cows as pets, think it barbaric and brutal that other countries eat cows as food, and dont keep them as pets. its difference in culture. Don’t try to force other country’s culture or common thought to other countries. its stupid. if they wanted to mention animals have feelings, they should have mentioned cows and sheep and pigs have feelings too. please think of these things before making such biased and offensive comments. Those people who eat dogs dont enjoy torture. THey just think of it as food, because they have grown up that way. its the culture. Dont generalize korea as a whole, but just specify that people who eat dogs shouldnt. but seriously, stop inflicting your own morals and your own opinions on some other people who are culturally, morally different. You just sound racist. sorry for the ridiculously long comment. I’m just annoyed and offended. Yes, i dont like eating dogs but i dont think it should be so EXTREMELY critisised like that. It’s culture. OLD culture. just change laws saying that the killing of dogs should be more sanitary and not too painful. there was a kid in my school who kept making offensive and hurtful comments on how i eat dogs, and how koreans are barbaric because they eat dogs. Well, dude, if you think of it like that, you’re indian and you people are very violent to women. You can kill them and people dont care. for example, some dad cut off his daughters head for returning home after a divorce. why dont we fix human issues before moving on to animals. a shop in nigeria sold human meat. If we continue like that, then even usa will be considered barbaric for using cows (which are sacred in some countries) as food and torturing them reguarly. seriously, stop with the racism. just Stop. Can you please make a more positive video instead of portraying KOREA as barbaric? Just say those minorities who eat it should be convinced not to. I feel like the intention was good, but the video was really offensive to some people. and the comments. Im crying 🙁 please, if you want to post a comment, please specify WHO instead of addressing the entire korean population. YOu’re addressing me, too, and im against dog eating. Please. So cruel…..so unneccessary. WE have to put a stop to it…..somehow. I wish that those eating/enjoying dog meat caused them some horrible disease like ALS aka Lou Gehrig’s or Mad Cow diseases…. is in fact supporting such horror…whats good for the Goose, is good for the Gander! sorry for my poor verbiage and spelling in my last post….but I’m very upset after watching the most disturbing video I’ve ever witnessed. My heart is heavy and is breaking just thinking of the wonderful animals being treated with such cruelty and inhumane treatment…. things like this….God must shudder and weep over this…sometimes I wonder if He ever regrets creating Planet Earth….. If I were God, I’d zap those abusers in same cruel manner they did to the innocent animals. I won’t even put salt on a slug because I feel THAT’S cruel…they did nothing to deserve being tortured for hours on end until they’re dead. What gives humans the right to even do that? I know they destroy flowers, and ruin beautiful gardens and must be dealt with as they’re pest! So I deal with them in a quick sharp slice…off with their heads!…and its over and done with! Just hope and waiting for the time when there will be a widespread of disease, from dog eating and there will be very soon as they just only think about the money being made and not the health issue, that’s when it starts. And I would not feel a thing towards the people dying from it, as they deserve it, we do not have a famine or at war, so there is not need, pure greed and evil and one day justice will be seen !!!!!!!! Earlier this year I went to Seoul on holiday and came back singing the praises of the lovely people and amazing history. I find it hard to reconcile the place I visited with the evil barbaric practices thankfully highlighted to world on sites like this. Animal cruelty unfortunately exists in all countries but it is individuals committing the act and not a whole nation, government and people sanctioning it. Firstly, cats and dogs are carnivores. The meat of carnivores is not eaten by any normal living creature. If you watch a wildlife programme, a lion may kill its enemy the hyena but unlike the omnivore zebra, buffalo etc.. it doesn’t eat the meat apart from at times of starvation. It knows that it is bad. We have a word for the sh*t of cows and horses – manure. It makes your tomatoes grow. The same product from cats and dogs is poisonous. The Chinese torture and kill most dogs in Winter because they stupidly feel the meat warms you up. The Koreans torture and kill most of their dogs in Summer because they stupidly feel the meat cools you down. It is all so baseless and suffering for no reason. If the Koreans insist on eating two of man’s best friends then they don’t have to torture them first. I am at a loss and so dissapointed in the Korean people. Very well said Dan…there are thousands who will agree with you 100%. KOREANS in general or the MINORITY who eat them? Seriously, this video is exaggerating. Im korean, Ive been to korea a few times, and no, these stores and shope are NOT THAT COMMON. THey’re exaggerating to prove their point. Its like the MINORITY. Very few ppl. Please dont say “im disappointed in korean ppl” and generalize Koreans. I feel very offended. Thats what you call RACISM. Just bcuz a few do that doesnt mean the entire ppl does it. Please, evaluate ur comment before posting. Too offensive. Not everybody eats dog meat in korea you know. You should choose your words carefully. That is so cruel, if we want to stop it then stop buying Korean products!!! If you seriously think so, you are sooooooo racist. Also, enforce some laws to ban dog eating or something if they’re so mad about it. What’s with all the making documentaries and stuff? Why don’t people perform actual actions against dog eating instead of posting documentaries like this that just bring more racism to the internet? The video could show petitions that korean people sign or actual letters or bills being attempted to pass? Action before talk, ppl. I know its not easy, but trying to is better than just talking about it. Yes, more people should know, but not this way. Can you please make a more positive video instead of portraying KOREA as barbaric? Just say those minorities who eat it should be convinced not to. I feel like the intention was good, but the video was really offensive to some people. and the comments. Im crying 🙁 please, if you want to post a comment, please specify WHO instead of addressing the entire korean population. YOu’re addressing me, too, and im against dog eating. Please. Love dogs, have six myself and was sick to the pit of my stomach watchig the documentary. Even the ‘lucky pet dogs dogs’ dont seem to be treated as real companians. Pumping dogs destined for the meat trade with some kinda muck to increase their weight prior to going to market, to be contained in absolutely discusting conditions, petrified awaiting their fate in front of others being cruelly killed and butchered in front of them. What kinda people could inflict such suffering to any animal let alone mans best friend. Id like to see Uk holiday companiies boycott vvietnam until things change . Totally discusted. What a cruel race ! Im upset that some people eat dog and cat in Vietnam, Korea etc but im more upset in the way the animals are actually treated from birth to market stall. Its just not right , absolute cruelty. I realise not everyone in the country agrees with current practice around the rearing and slaughtering of dogs for meat but something has to be done , some enforcement and standards set for the treatment of all food chain meat. Its barbaric and the dogs and oter animals obviously suffer terribly . Discusted if honest and id never holiday in any of the countries where this kinda cruelty takes place on the scale that it seems to. Stop generalizing a whole race based on a freaking minority. You don’t know me so what gives you the right to call me cruel. And yes, by calling my race cruel, you’ve included me too. I adore dogs; they are pets, not food. See? I called YOU racist, not your entire race. That’s how it works. One country does not have the right to diiactate what another country can eat. However, all of humanity has a moral duty to voice outrage and condem depravity no matter where it exists. The boiling of live, skinning of live, beating to death, blow torching of live, hanging, dismembering and more…is not cultural. Any argument that attemps to equate the admitted suffering in factory farming to the abhorrent treatment of dogs is ignorant of the truth quite obvious a few more videos with sound for better to hear the prolonged cries as a dog is dismembered while fully conscious.